Smouldering volcanoes, dazzling vistas and beautiful people – welcome to the Aeolians. Between the smoking stack of Mount Etna on Sicily and the threatening mass of Vesuvius above Naples lies the deep, blue Tyrrhenian Sea, and in that sea lies a row of smaller volcanoes. These are the Aeolian Islands, a mixed bag of rough and sparkling jewels that attract an equally mixed crowd of Milanese magnates, Sicilian princes, families in search of a quiet holiday, an international crowd and a few Italian northerners in the know. Panarea is the smallest and most ancient of the seven Aeolian Islands. It is now a wonderful mix of rocky hills, green slopes and the pure architectural lines of rectangular buildings fronted by thick columns and generous arches. It is also very well-known as the party island! Raya Hotel: A tiny Aeolian neighbourhood clinging to the hillside, hotel Raya is set amidst the surrounding bougainvilleas, olive and lemon trees, widely described as a “ Cult Hotel”. D espite that it is quite expensive, it worth it for just one night for the breath-taking view and ambience. Quartara Hotel: a very small, family-run hotel only 10 minutes walk from the port. What is special about it is the two friendly sisters that run it who are extremely helpful as well as the fantastic Italian food that they offer for both, lunch and dinner. 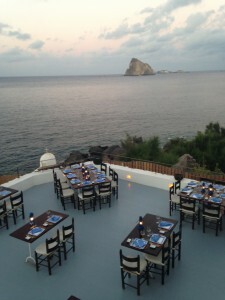 Bio Ristorante (Raya Hotel): it is on one of the most beautiful terraces in the world, admiring the spellbinding sight of smoking Stromboli. 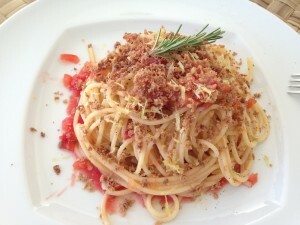 Try delicious dishes using organic ingredients among the beautiful Italians. It is quite overpriced but the view is worth it. Da Pina: don’t be shocked if you are dining next to Leonardo Di Caprio! Probably the best restaurant on the island in my opinion. Apart from a unique selection of seafood pasta must-try are the famous, home-made aubergine gnocchi, the octopus carpaccio and the pistacchio parfait. Da Antonio “Il Macellaio”: don’t miss it if you are a meat fan! Apart from a tender and tasty “bistecca alla Fiortentina” you can try a large selection of steaks, lamb and pork chops and local sausages. Diving, yaughting, dancing and swimming are the main activities in this tiny yet beautiful island. If you are used to the Greek island beaches you will be disappointed by the beaches as there is only one accessible by foot beach, Cala degli Zimmari, which even though a pretty bay with deep transparent-blue water but it is a 30 minutes walk. Otherwise you can rent a speedboat for 60-100€/day and visit a couple of other lovely beaches. 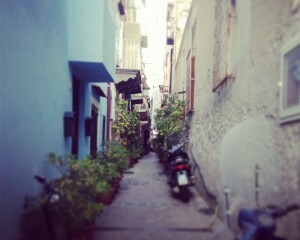 There are no vehicles on the island (apart from golf-cart taxis and a police buggy), but don’t worrry, it is so small you will love taking walks in the tiny alleys. An unspoiled Aeolian Island that its people want to keep it as it is. Salina is known as a place where little happens expect before some years ago where “il postino” arrived. But even cinema celebrity has failed to change it. It is one of the biggest Aeolian islands (probably the second biggest after Lipari) and it is worth visiting for its greenery, its beautiful and at the same time scary cliffs and of course, Hotel Capofaro. Capofaro Malvasia & Resort: the 20 room s of the resort are clustered in 7 cottages built in the typical Aeolian style overlooking the vineyards to the sea with a breath-taking panorama. The sunset with the distant view of Stromboli and Panarea is a once-in-a-life-time experience. It is expensive but undoubtedly worth it as you will probably spend most of your days relaxing by its pool or under the eucalyptus trees. Hotel Santa Isabel: located in Malfa rises on the rocky promontory of the cliffs peak of Scario Bay. Located on a panoramic position, offers large living spaces and terraces overlooking the beach. Hotel Signum: one of the oldest and most charming hotels of the island. It is right in the centre of Malfa village in an old house hidden in the trees. Even if you don’t stay there you must try its well-known restaurant, one of (if not the best) on the island. Bar Da Alfredo: even though it serves the world’s greatest granita I thought it was touristy and not worth the drive. If you are near there and feel like a refreshment do try the almond one! You must rent a car as it is a bit island, and use it to take a circular trip around the island. It offers indelible sights owing to its high, sombre coasts, its characteristic immersed terraces, pleasant small beaches and inhabited centres. Pollara beach, the famous cove where Il Postino was filmed is worth the visit as the green mountain and the blue waters under the high cliff is not something you see every day. It is one of Europe’s tallest and most active volcanoes and gives the impression of being in direct contact with the earth’s core. The island’s main village is the beautiful San Vincenzo, a sleepy place of whitewashed houses, narrow lanes and bougainvilleas. More recently, it has also become the island of choice for a select crowd that includes Dolce & Gabbana that have a house there. 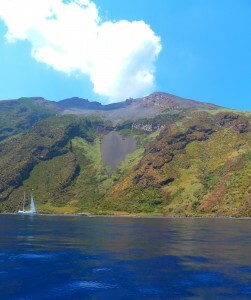 You don’t need to stay at Stromboli but simply take a day trip from Panarea or Salina. If you feel like it go early and rent a boat to go around the island and see the melting lava and the regular volcano explosions. Another reason to rent a boat is to visit Ginostra, a village accessible only by boat, mostly worth it for the hidden gem, L’Incontro, a fantastic local restaurant right at the top with a view of the Aeolians. 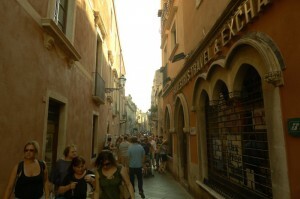 Alternatively you can hire an electric taxi and go around the beautiful village of San Vincenzo. 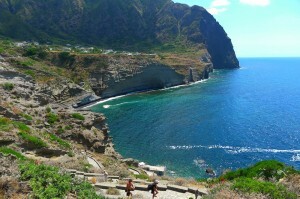 It is the biggest of the Aeolian islands and the most historical. I thought it was too crowded and not as exclusive as the rest of the islands but it has the most beaches and the largest city centre. Eat at Lipari’s finest restaurant in the family-run Ristorante Filippino (09098110002) or its sister restaurant two blocks down. We didn’t visit it but heard very good recommendations for its baths which are effective against skin and back problems. The baths are operated by the municipality , which charges a small amount with no facilities. Once you are there Taormina in Sicily, a picturesque village right at the top of a mountain is worth the visit for a couple of days especially since it is in between Catania airport and Milazzo port. It is way more crowded and touristy than the Aeolians but worth the visit 100%, not only for its Michelin restaurants and aristocratic hotels but its beautiful beaches as well. You can get a ferry from Milazzo or Messina in Sicily (they run regularly through-out the day). 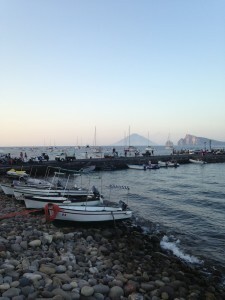 It takes roughly two hours to reach Lipari and then 30-45minutes for the rest of the islands. I used okferry and found the website very useful.